Who do you trust more to care for your neighborhood: a local business with a stake in the community, or an out-of-state corporation with a history of environmental and labor abuse? Almost anyone would pick the former choice. But right now one of the country’s biggest out-of-state coal companies is trying to convince Montanans to take a bad deal, accepting environmental degradation and pollution for a project that would actually hurt local business. At issue is Arch Coal’s proposed Otter Creek coal export mine. Arch, a St Louis-based company that currently has no major mining operations in Montana, wants to get rich by selling coal to China and other countries, even as demand for coal in the U.S. declines. Feeding mainly overseas markets, coal from Otter Creek would be carried by train through Missoula and dozens of other towns, en route to proposed export terminals on the west coast (Arch owns a large stake in one of these ports). Critics of coal exports have rightly pointed out that transporting and burning coal adds to local health hazards and global problems like climate change. And contrary to claims about “economic investment” in Montana, the pillage-and-run model of Arch Coal can only adversely affect business. In 2005, then-Governor Brian Schweitzer directed Montana’s Department of Environmental Quality to create a Climate Change Advisory Council to find cost-effective solutions to global warming. Schweitzer had been in office less than a year, and this seemed like a promising first step on climate change for his administration. But almost eight years later, the state’s resolve to act on climate seems to have dissolved. This isn’t for want of solutions. The Advisory Council recommended 54 policies to reduce carbon emissions, from stronger clean energy standards to helping consumers make smart energy choices. But Schweitzer largely ignored or forgot about the report he’d commissioned. His administration became known instead for a very different kind of energy policy: strip mining and exporting Montana coal. It’s been eight years since our former governor suggested the state do something serious about climate change. It’s time our current governor acted on that advice. Gov. Steve Bullock has been in office almost as long as Schweitzer had been when he gave his directive to the DEQ. But Bullock has yet to take any comparable step on climate change, though the threats have not diminished. Police stopped the sit-in after about 10 minutes, and the protesters willingly accepted citations for trespassing. They are scheduled to appear before city court this morning. 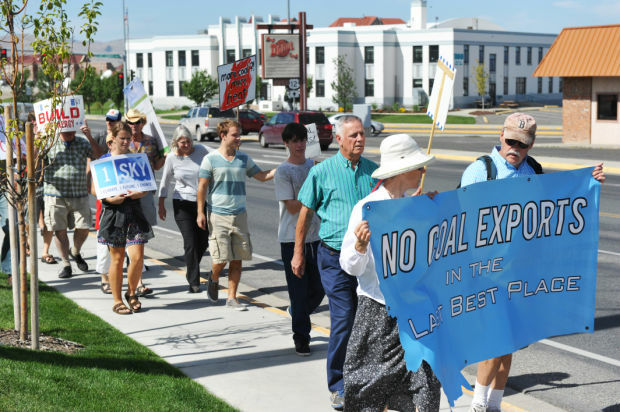 “They were symbolically reclaiming that railroad right of way from the coal companies that use it to transport dirty coal,” Nick Engelfried, a rally organizer with the Missoula-based Blue Skies Campaign, said after the event. The Blue Skies Campaign also staged a weeklong protest inside the state Capitol building last summer that led to 23 arrests, according to the group. “There’s nothing that conveys the moral urgency of an issue like this in the same way that civil disobedience does. It conveys the importance of the issue in a way that holding signs cannot,” Engelfried said. A group of 14 people admitted Monday to trespassing in the Montana Capitol building last summer in protest of coal development in Montana. They’ll pay fines and get the chance to keep the matter off their records. But the group, affiliated with the Missoula-based Blue Skies Campaign, said their fight over coal and global warming isn’t over. “I certainly anticipate that there will be more direct action and more civil disobedience,” Nicholas Engelfried, of Missoula, said outside Municipal Court on Monday morning. 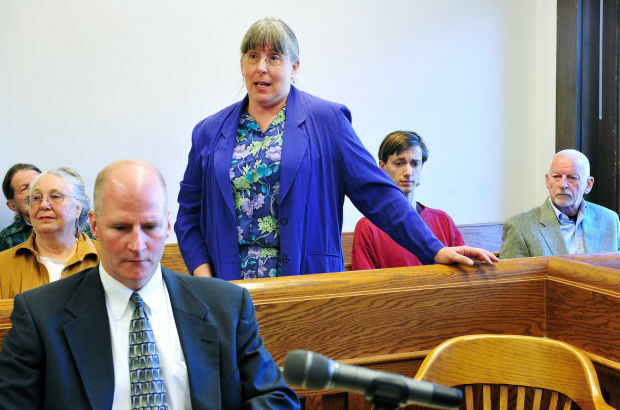 Engelfried, 25, entered his no-contest plea for misdemeanor trespassing before Municipal Judge Bob Wood, along with John Lawrence Ashmore, 70, of Seeley Lake; Margarita McLarty, 68, and Linda Kay Kenoyer, 58, both of Livingston. MCLEAN, VA, April 23, 2013 On Tuesday, members of the Chesapeake Earth First! and the Montana-based Blue Skies Campaign demanded that one of the world’s largest candy companies sever ties with the coal industry. At issue is the Tongue River Railroad, a proposed 40-mile railroad in Montana that would open some of the nation’s largest coal deposits to strip mining. Forrest Mars, Jr., who along with other members of the Mars family owns the candy company Mars, Inc. is one of three financial investors in the railroad. If built, the Tongue River Railroad would transport coal from southeastern Montana to existing rail lines, which would carry it to the West Coast for export. During the long journey west, diesel-powered trains carrying coal in uncovered cars would pass through dozens of communities in Montana, Idaho, Oregon, and Washington, adding to air and water pollution. Once burned in overseas power plants, the coal would contribute to climate change. The Tongue River Railroad would also affect agricultural land in Montana by bisecting ranches and industrializing a rural part of the state. Forrest Mars, Jr. who owns a ranch in Southeast Montana, originally opposed the railroad because it would have cut through his property. In 2011, Mars bought a stake in the project and used his insider’s influence to change the route so it no longer affects his land. He now supports and is helping to finance the railroad. Blue Skies Campaign is a grassroots organization based in Missoula, Montana, dedicated to protecting communities from coal pollution. Chesapeake Earth First! uses a front-line, direct action approach to confront and halt ecological destruction in the Chesapeake Bay watershed and beyond. HELENA, March 6th, 2013 – On Wednesday, March 6th, volunteers from the Blue Skies Campaign will deliver approximately 2,000 comments from Montanans concerned about the toxic effects of coal mining and transportation to the Department of Environmental Quality, on the final day of a DEQ public comment period on Arch Coal’s proposed Otter Creek Mine. The main incentive to mine Otter Creek is to supply coal for overseas exports. This means increasing coal train traffic through towns like Billings, Bozeman, Helena, and Missoula, as trains travel to proposed export terminals on the West Coast. Coal trains would cause local air pollution and road congestion in affected towns, while eventual overseas coal combustion would also add to climate change, contributing to droughts and wildfires in Montana. Montanans worried about coal train traffic and climate change want the DEQ to consider these big-picture impacts, as the agency prepares to craft an Environmental Impact Statement for the Otter Creek project. They say it is impossible to gauge the full environmental effects of the mine, without considering the results of coal’s transportation and combustion. Many comments to be submitted Wednesday urge the DEQ to look at these larger impacts. Groups involved in the Wednesday drop-off include the Blue Skies Campaign, Montana Environmental Information Center, CREDO Action, 350.org, and Greenpeace. MISSOULA, February 14, 2013 – While thousands gathered at the National Mall Sunday for the largest climate rally in US history, Missoulians joined a local support rally in their own community. Around 200 people turned out to the rally, which focused on calling on Montana policymakers to promote clean energy, and halt destructive fossil fuel projects like the Otter Creek Mine and the Keystone XL Pipeline. The rally began downtown at the XXXs at 12:00pm, where participants heard from speakers including Mayor John Engen; Beth Schenk, RN at Providence St. Patrick Hospital; UM climatologist Dr. Steve Running; and Vanessa Braided Hair, an activist and member of the Northern Cheyenne. After the rally, most of the group marched to Higgins Street and gathered on the bridge with signs and banners. Today’s rally was sponsored by: Blue Skies Campaign, Sierra Club, National Wildlife Federation, Montana Elders for a Livable Tomorrow, University of Montana Climate Action Now, Transition Missoula, Montana Audubon, Montana Conservation Voters Education Fund, and Alternative Energy Resource Organization (AERO).